A group of New York pizza aficionados help you transform underwhelming slices to delectable ones. Crispy on the outside, pillow-soft on the inside, a perfect balance of sauce and mozzarella. You know good pizza. For those "lesser" slices you grab on the go—from the dollar parlor or the bodega up the block—there's this emergency kit stocked with three spices: Italian black truffles with Atlantic sea salt, organic Italian herb mix, and Aleppo chili pepper. The kit was created by a group of New York pizza aficionados who compiled the ingredients that set apart superior pies from average ones. Hint: it's all in the delectable details. Send the emergency refresher to your non-New York dwelling friends, the college student on a budget, or your best unofficial pizza critic. Hand-assembled in New York. Contains 3 vials of approximately 0.5 oz salt and spices each. Cute pkg, wish it would close up so I could store it in the box. I bought this for my friends who are going away to upstate NY for college. We live super close to the city so we're spoiled when it comes to good pizza. They thought it was a cute & funny idea and said they'll definitely use it! Perfect gift for a New Yorker! It's small so it can fit into a purse, coat pocket, etc. It adds a special touch to your slice on the go. My best friends love pizza. They LOVE PIZZA. So naturally when this came up I knew this was the perfect gift for them. 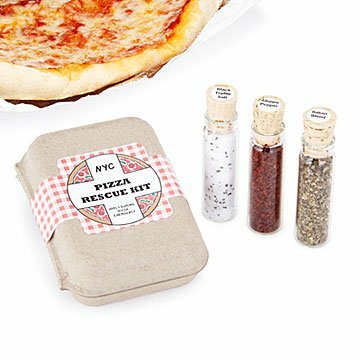 It's cute and compact and perfect for the pizza lover in your life. This product is awesome. The spices come in a small container, which fits perfectly anywhere. I'm in the process of buying one for myself!